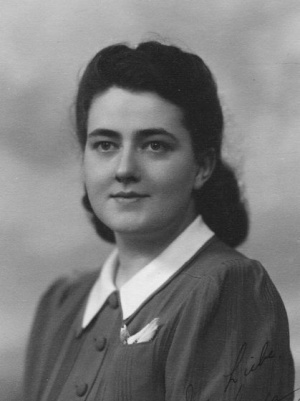 Elfrieda Klassen Dyck: nurse and church worker; born 10 March 1917 in Donskoye, Neu-Samara Mennonite Settlement, Russia to Franz F. Klassen (30 April 1870, Lichtfelde, Molotschna, South Russia - 21 January 1924, Dolinsk, Neu Samara, Russia) and Justina (Wiebe) Klassen (30 August 1874, Landskrone, Molotschna, South Russia - 26 June 1933, Winnipeg, Manitoba). She was the fourteenth child in a family of ten boys and four girls. On 14 October 1944 she married Peter J. Dyck (4 December 1914 – 4 January 2010) in Whaley Bridge, England. They had two daughters, Ruth and Rebecca. Elfrieda died on 20 August 2004 in Scottdale, Pennsylvania, USA. In 1925 Elfrieda Klassen moved with her widowed mother and siblings to Winnipeg, Manitoba. At a young age she kept house for her working brothers and cared for her ailing mother while she attended school. Upon graduation as registered nurse in 1939 from St. Boniface Hospital, she nursed at the Steinbach Hospital in Steinbach, Manitoba. In 1942 she volunteered with Mennonite Central Committee (MCC) for service in war-torn England. Elfrieda worked in a home for children and babies in North Wales and then, with Peter Dyck, started a home for convalescent boys in Taxal Edge, near Manchester. It was here in Whaley Bridge that they were married in 1944. In 1945 Elfrieda and Peter were assigned by MCC to begin relief work with Mennonite refugees in the Netherlands. They organized the food and clothing distributions from North American Mennonites, held weekly meetings in Amsterdam for Mennonites, and started a camp for Mennonite refugees from Russia and Prussia who had found their way to the Netherlands. In all, they fed one in ten of the total Dutch population and were recognized by Queen Juliana in 1950, when she knighted Peter. Elfrieda’s oldest brother Cornelius F. Klassen, working on behalf of MCC, discovered Mennonite refugees in Berlin, Germany in 1946. In 1946 Peter and Elfrieda set up a camp in Berlin that grew to 1,200 refugees. They organized the housing, health care, feeding, education and church life for the refugees. It was necessary to work closely with the United States military for permission to live and to work at getting the refugees out of this zone which was surrounded by the Russian army. Elfrieda was alone in Berlin when the word came that she should get all the refugees ready to board a train for transport to meet a ship going to Paraguay. Peter managed to reach the train station in time and join the exodus. The miracle of their crossing the “red sea,” known as the "Berlin Escape," has been told in books, plays, film, and in many presentations they gave in churches in the following years. Elfrieda Dyck accompanied four shiploads of 5,616 refugees, including approximately 4,500 Mennonites bound for Paraguay, to South America: two of these were with Peter, and in 1948 she accompanied two transports alone. There were problems on these voyages with which Elfrieda had to deal - before, during and upon arrival. The most dramatic problem occurred on the Charleton Monarch when the crew mutinied, the electricity failed, the ship drifted on high seas, and the captain locked himself in his cabin. Another voyage led to three and a half months in a makeshift tent camp in Buenos Aires during torrential rains. Elfrieda showed her ability to organize, analyze a situation, and demonstrate compassion for each person. The Dycks recounted these experiences in their 1991 book, Up From the Rubble published by Herald Press. In 1957 they rejoined MCC and with their two daughters moved to Frankfurt, Germany. Peter was in charge of the MCC program in Europe and North Africa. Elfrieda was in charge of the MCC parcel program to Russia. During the next ten years she purchased items, packed and sent thousands of parcels to needy Mennonites in Russia at the request of their relatives in North America (the Soviet Union allowed packages originating from Germany). In 1967 the Dyck family relocated to Akron, Pennsylvania where Elfrieda nursed at Fairmount Rest Home for the next nine years. They spent one and a half years in Scottdale, Pennsylvania where Peter was interim pastor in 1984. Then in 1995 they moved from Akron to a retirement home in Scottdale. Elfrieda dealt with heart problems all her adult life and often exerted much willpower to be able to support Peter’s speaking ministry and accompany him on many speaking engagements for MCC. With kindness and generosity, Elfrieda made her mark on the world. She loved the church and her family and was generous with both. "Elfrieda Dyck, 87, Mennonite Who Helped Thousands Resettle, Dies." New York Times (5 September 2004). 4 January 2011. http://www.nytimes.com/2004/09/05/national/05dyckobit.html. Epp, Marlene. Women Without Men: Mennonite Refugees of the Second World War. Toronto: University of Toronto Press, 2000: 90. The Mennonite (7 September 2004): 7. Mennonite Brethren Herald (24 September 2004): 13. Mennonite Weekly Review (30 August 2004): 1-2. Mennonite Church USA Archives, Goshen, IN: "Peter Dyck (1914- ) and Elfrieda (Klassen) Dyck (1917- ) Collection," Hist. Mss. 1-892. Scott, Ruth. "Dyck, Elfrieda Klassen (1917-2004)." Global Anabaptist Mennonite Encyclopedia Online. December 2010. Web. 22 Apr 2019. http://gameo.org/index.php?title=Dyck,_Elfrieda_Klassen_(1917-2004)&oldid=143347. Scott, Ruth. (December 2010). Dyck, Elfrieda Klassen (1917-2004). Global Anabaptist Mennonite Encyclopedia Online. Retrieved 22 April 2019, from http://gameo.org/index.php?title=Dyck,_Elfrieda_Klassen_(1917-2004)&oldid=143347.